Wild violet, is a cool season, perennial, broadleaf weed. It is one of the first plants to flower in spring, growing well during cool parts of the growing season, and is usually found in shaded, moist areas. The heart-shaped leaves have scalloped edges with a waxy coating. The waxy coating on violet leaves tend to repel weed control materials, with little chemical being taken in by the plant. Violets tend to be resistant to most herbicides but are most susceptible in the spring while they are flower. Controlling wild violets in a lawn or landscape can be a difficult challenge, and will certainly require more than one herbicide application before it is accomplished. As with any lawn weed, the best control practice is to promote a dense and healthy turf through soil testing to mointor pH, proper mowing, fertilizing and irrigation. Creeping woodsorrel is a spreading perennial weed with a reddish-purple color that frequently roots at the nodes. The three heart-shaped leaves of creeping woodsorrel is nearly identical to yellow woodsorrel. Creeping woodsorrel is most commonly introduced to the landscape through nursery container-grown landscape plants. Once transplanted and established it will quickly escaped the landscape beds and invade the surrounding turf. Established creeping woodsorrel is difficult to manage and control because it is also resistant to most weed control products. Click for more information on Purple Oxalis. Japanese Stilt Grass, or Nepalese Browntop, is a pale green annual plant that grows up to 3 1/2 feet in height. The leaves are asymmetrical and lanced-shaped with a distinctive midrib and range from 1 to 3 inches long. Late summer yields flowers, and soon after fruits mature on the plant. It is found mostly in shady locations in moist or dry soil. It can be pulled from moist soil or mowed in late summer before the seeds are produced. The best way to control Japanese Stiltgrass is with very early spring pre-emergence herbicides. It can also be managed in the summer with certain post-emergence herbicides that are labeled for the control of summer annual grassy weeds. Click for more info on Stiltgrass. Weedy Bluegrasses Found in Lawns. Annual bluegrass and roughstalk bluegrass are both very obvious in many lawns right now. Both of these grassy weeds are very common in residential and commercial turfgrass and are a problem because there is no adequate control for them in the Kentucky bluegrass/Tall Fescue lawns that comprise most Baltimore area lawns. Annual bluegrass (Poa annua) is a cool season annual grassy weed that starts germinating in late summer or fall, as temperatures fall, and continues to germinate throughout the winter into early spring. Because of this growth habit, it is more competitive than other turf cultivars during the cool season, accounting for the spring annual bluegrass invasion. Annual bluegrass has light green flattened stems and silvery-colored seed heads that cause yellow or light green patches in lawns. It is especially noticeable in April and May. Annual bluegrass is able to survive low mowing heights of less than 1 inch and still reseed. It tends to die out in hot summer weather. Roughstalk bluegrass (Poa trivialis) is an undesirable perennial turf species that do well in moist, shaded areas but lacks heat and drought tolerance. 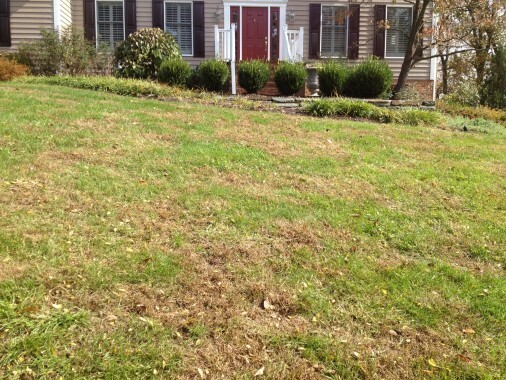 It is considered short-lived but can persist in Baltimore area lawns. It is characterized by a mid/light-green leaf coloration that browns out quickly above 80 degrees, resulting in distinct dense, patchy growth where other grasses tend to be absent. Roughstalk bluegrass is noticeable in the spring with its lime-green color and in the summer when it goes brown and dormant under heat stress. Rough bluegrass favors light, frequent irrigation, moist/wet soils, low mowing heights and/or high fertility. Dormant Roughstalk bluegrass is sometimes misdiagnosed as grub injury in late summer, because of its shallow root system. A thick, healthy lawn is the best defense against these invaders. Open spots should be overseeded to establish a vigorous turfgrass. Pro-Lawn-Plus’s 5 treatment program ensures the health of your lawn is at its peak to compete with these ‘weed’ grasses and will slow down their spread. In addition to our regular program, maintaining proper growing conditions including adequate sunshine, good drainage, proper mowing height and relieving compaction (aerating compacted lawns), will help. There is no easy control procedure successful in controlling either species in Kentucky/Tall fescue lawns. But early removal or spot spraying with a non-selective herbicide; then reseeding can be successful if you are able to change the conditions that caused it (shade and moisture). 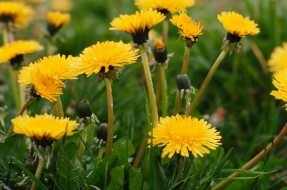 Everyone knows that weeds make your well-manicured lawn look unappealing. But weeds cause bigger problems than looks from the neighbors. They are in direct competition with your beautiful lawn! They steal sunlight, water and nutrients from your lawn. Eventually they muscle in and take over. It is important for the health of your lawn to limit the overall number of weeds it’s competing against. There are millions of weed seeds throughout your lawn lying dormant, waiting to be ‘activated’. They are brought by wind, rain, animals, even your mowing service. Mother Nature is resilient; she makes it hard to eliminate weeds completely. But with Pro-Lawn-Plus’s 5 treatment program and some good mowing practices you’ll, be on your way. Raising the height of your mower is one of the simplest and most important things you can do for your lawn’s health. Adjust your mower so that it cuts your grass at 3 to 3.5 inches high. The basic rule is: the hotter the weather, the higher you should mow. Higher mowing promotes deeper roots, prevents water loss by shading the soil, and reduces weeds by preventing sunlight from warming seeds. Taller grass also cools the soil and reduces heat stress. Mowing frequency is also important. Be sure that no more than one-third of the total grass blade is removed in any one mowing. Once per week is sufficient when your grass is actively growing. During late April and May, many lawn weed grasses go into flower and will seem to grow even faster. It is even more important at this time NOT to let the grass get too tall between mowing. Instead of bagging your grass clippings, leave them on the lawn. Unless they are exceptionally long, grass clippings won’t cause any problems. In fact, they can provide about one-third of your lawn’s nutrient needs and are a valuable source of organic matter. Furthermore, this environmentally friendly practice will reduce the amount of grass clippings clogging up our landfills! Best methods for controlling crabgrass and other annual grassy weeds. Early spring is the best time to control summer annual grassy weeds like crabgrass (Digitaria spp), foxtail (Setaria spp), goosegrass (Elusineindica), and others like Japanese Stiltgrass (Microstegium vimineum). Being annuals, these weeds die each fall and winter then re-germinate from seed in the spring when the soil temperatures approach 55° F. The best method of controlling summer annual grassy weeds is with a pre-emergent herbicide because once crabgrass, foxtail and other annual grassy weeds germinate and get established, they are extremely difficult to control. This is an essential part of our Early Spring Lawn Treatment. There are several management practices you can utilize to help minimize crabgrass and other annual grassy weed “pressure” in your lawn. The first is good mowing practices. We find that poor mowing is the primary reason for heavy crabgrass infestations. Avoid scalping the lawn. Never cut more than 1/3 of the grass blade off at any one mowing and never mow shorter than 3” after the grass starts growing in the spring. Second, avoid spring aeration, dethatching or any other activity that disturbs the soil during peak crabgrass season. Also avoid seeding in the spring as well. The pre-emergent herbicide inhibits turfgrass seed as well as annual grassy weed seeds. Very rarely will we see 100% preventative control of crabgrass. Usually some will break through, especially in thin and bare spots. In those cases, you can hand-pull it if it is just a few plants, otherwise you can use post-emergent herbicides. While the weeds may be green during the summer, they will die out and brown in the fall. Worse yet, the areas that were overrun with crabgrass then become bare spots. Those areas would also be subject to soil erosion during the winter and thus potentially harming the Chesapeake Bay. A thick lawn promoted by a responsible lawn care program with the proper use of fertilizer and weed control products is a great way for you to contribute to helping the Bay. More information about the environmental benefits of turf. What about our Pets? Pets and your lawn. Hello Mike Pusateri, Operations Manager of Pro-Lawn-Plus, here. I’ve been in the industry for over 20 years and get a lot of questions from customers. One of the most common is about pets and lawn treatments. Some people think that if they have pets they cannot use our service. Pets can absorb material through the pads of their feet. So a liquid herbicide is something pet owners should think about but not be overly concerned with. The spray can only cause a reaction while wet. Once the spray dries, it will not cause any harm. On sunny days, the materials dry in an hour or less. Pro-Lawn-Plus has a few ways to help in servicing your lawn and reduce exposure to your pets. First, we only spot spray for weeds in most cases. We try not to “blanket” your lawn unless the lawn is overrun with weeds. If our techs see animal toys or water bowls in the lawn, they will remove them from the spray area. Also, we can set up your account to be a ‘call ahead’, which lets you know ahead of time when we’ll be out, so you can have your pet inside prior to our visit. We recommend keeping them off of the lawn for one to two hours after an application, to allow drying time. Pro-Lawn-Plus will not do herbicide applications if pets are on the lawn. We will attempt to call and knock on the door to get pets inside during treatments. If we don’t make any contact, we will call to reschedule. We are committed to providing you with a beautiful, environmentally beneficial lawn to enjoy with your whole family, including your pets.